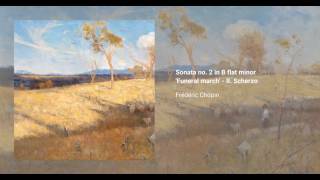 Fréderic Chopin completed his Piano Sonata no. 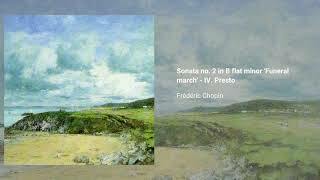 2 in B flat minor, op. 35, in 1839. 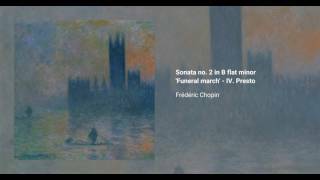 This work is often nicknamed Funeral March in reference to its most popular Marcia Funebre third movement, which was written two years earlier than the rest of the sonata. 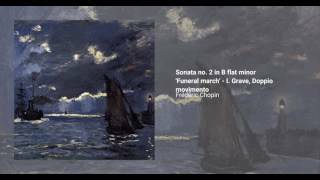 This movement was later adapted for orchestral by both Leopold Stokowski and Sir Edward Elgar, and played in a number of well known funerals (the original piece had been played at the graveside during Chopin's own burial). 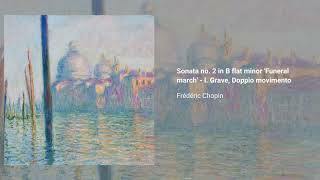 There is no shortage of drama in this Sonata: Chopin uses his considerable gifts for innovative armony here, and it consistently impresses, especially in the virtuosic conclusion. 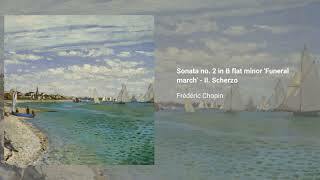 The work confused contemporary critics, who found it lacking cohesion.